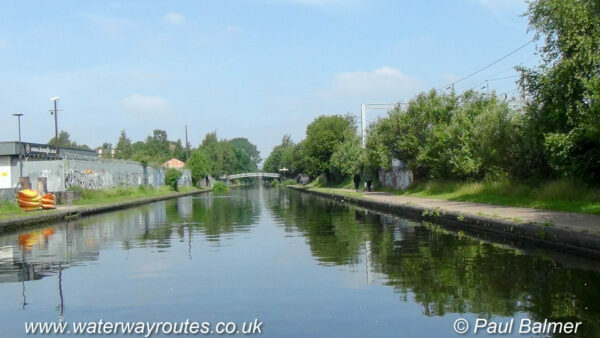 The wide straight Main Line of the Birmingham Canal Navigations (BCN). Cutting off the three loops (Oozells Street, Icknield Port, and Soho) the new Main Line is wide and straight with towpaths along both banks. It must have seemed like a motorway to the old boatmen. We are looking towards Rotton Park Junction where the bridge crosses the canal. Icknield Square Junction is behind the camera. The Icknield Port Loop runs off to our left between these two junctions.